Because A. G. Becker dealt almost entirely in fixed-income securities through the late 1920s, and even then, particularly in commercial paper and short-term notes, interest rate changes didn’t affect the business (and position values) nearly as much as long-term rates affected bond and stock prices (and inventory values). On the other hand, stock market prices were influenced by economic developments, and vice versa, those trends were iterative with interest rates. “Panics” and stock price declines went hand in hand and affected the general economy especially in the 1907 and 1920 periods. With the advantage of hindsight, one can see that from 1910 (after the recovery from the 1907 panic) through 1920-21, stock market prices declined by some 50% over a 10-year period. During this same period, short-term interest rates zigged and zagged between 3 1/2% and 6% until near 1920, when, as mentioned earlier, they spiked to 8%, slightly ahead by a year of the stock market hitting its low in 1921. Becker’s business apparently prospered during this period. After a stock market low and interest rate peak in 1920, short-term interest rates dropped steadily until 1927-28 to somewhat below 4%, while stock market values boomed to new highs, with a peak in the final months of 1929. By this time, interest rates had again risen, but only to about 6%. The primary focus in this period of U.S. financial and economic history is quite understandably the rapid, downward course of common stock values over 32 or so months into 1929 - the “crash” - contributing to the “Great Depression” that followed in the 1930s. Special attention during this period was given to the larger company stocks listed on the New York Stock Exchange and those making up the Dow Jones Average. It is clear that other economic and financial forces were at work and had effects during this period - such as Federal Reserve policy, the status and trends in the underlying industrial, commercial, and agricultural sectors of the U.S. economy, similar developments in foreign nations whose economic activities and financial markets were strongly interrelated with the U.S., and such other factors as fluctuating currency values and gold price movements. Truly understanding the movement of stock market values of this period is complicated by measurement problems. The principal measure used for “the stock market” at the time was the Dow Jones Index (DJI), which had only been “invented” in 1896 and originally was made up of the average of stock prices of 12 companies. The index was extended in 1916 to cover 20 companies by removing four and adding 12 new companies into the calculation. The coverage was further extended in 1928 to include the stock prices of 30 companies along with new calculations taking into account stock splits - which during this period were rampant. A number of analysts have critiqued the DJI as a “proxy” for the “market” especially as applied to this time period. However, it was the measure which was broadly followed at the time (as it is even today, on a popular basis). Thus we will use this number as a more general than precise measure of common stock value changes during this tumultuous period of U.S. financial history. It is generally recognized that stock market values, as a whole, reached a peak on March 9, 1929, and were up about 500% over the level of 1921. In those eight years, general economic activity was high. Technological change was rapid. Opportunities for growth and profit were widespread. As noted earlier, as best can be determined, this was probably a “golden” period for A. G. Becker & Co. The firm’s growth and prosperity were heavily based on the decision by the founder in 1915 to diversify and create a broad-based investment securities house centered organizationally on a group of selectively recruited, very able younger men with ambition, competence, and good character. And even before his death, as untimely as it was, the founder had prepared two well-experienced nephews and, prospectively, a son, to provide the firm’s leadership for many years forward. From March 9, 1929, the market declined by some 50% through Black Thursday (October 24) and Black Tuesday (October 29) to November 13. During this period, reportedly, Irwin Fisher, noted Yale economist, proclaimed to investors that their money was safe. A recovery over the next six months took the market up some 47% into April 1930, regaining about one-half of the decline which had taken place from March 9. Then, however, a sobering if not a fear-drenched mood took over, and the market declined steadily and substantially from April 1930 to August 1932, some 28 months, to bottom out at 10% of the value on March 9, 1929 - an aggregate decline over those eight months of some 90%. For many individual and institutional investors, this decline was devastating and resulted in a wide range of bankruptcies. The fierce decline in the stock market ushered in the Great Depression with high unemployment, soup kitchens, and large-scale farm foreclosures, along with falling prices. Situation at A. G. Becker & Co.
As noted earlier, Becker only began to deal in common stocks in scale in about 1927. Thus, the firm was not as deeply dependent on common stock trading as many firms with long histories as “stock brokers” or “wire houses.” Becker’s customer base was still strongly “institutional” with investment policies and regulatory requirements focusing clients on investments in a range of fixed-income securities. However, the firm clearly was developing a “retail” business in “conservative” stocks - individual, personal client, and trust accounts - especially in the Chicago area, being handled by such salesmen as Herb Schaffner, Al Pearson, Charlie Ritter, and Harry McCosh under the oversight of Andy Baird. A similar organization was emerging in the New York Office under June Johnston. A great deal has been written about Wall Street during this period, but the Becker archives tell us relatively little that was taking place within the firm. However, we can deduce from certain materials as to these activities, supplemented by Tribune and New York Times reports and advertisements. As described in the Advertising Programs section of Appendix 5, the firm was promoting the careful selection of common stocks, thoughtful diversification, a strong portion of every portfolio in fixed-income securities, the purchase of stocks and bonds with a good underwriting provenance, and certainly, investing with a longer view versus seeking quick profits, acting on tips, attempting to ride on the coattails of pool operators, and the like. In the meantime, the market was “frothing at the mouth” - until the great descent of late 1929 and into early 1930. The archives include an interesting memorandum to all employees from A. G. Becker President Schaffner dated November 13, 1929. He comments on the "tremendous" shrinkage in market values which has just taken place, but suggests that the recession will be short-lived, and that "holders of good securities in sound well-managed businesses have no cause for concern." With the benefit of hindsight we can see that this was an optimistic forecast. In 1930 and 1931, the firm continued its institutional advertising emphasis, promoting long-term investing in strong U.S. companies and industries, as described in Appendix-5. The firm began in 1928 to publish a quarterly Investment Bulletin which appears to have been published each quarter through mid-1932. The Bulletin commented on current economic affairs, the economic outlook and selected other topics, including some brief comments on stocks that Becker recommended. During the same period, the firm began to publish a little pamphlet titled Business Briefs in which primarily individual companies and their securities were recommended. The Bulletin appears to have been directed primarily to the institutional investor, and the Briefs to the individual investor. See Appendix-7. It is not clear who was authoring or overseeing these reviews. David Friday is shown to be the author of a key article in one of the bulletins. Perhaps he had a broader role by this time (see below). Given the period during which these reviews were published, they provide fascinating reading for students of U.S. financial history. In about 1932, the firm’s institutional advertising program was curtailed, probably due to the serious attention and concern now being given to expense reduction as transaction activity dropped off precipitously. As early as in a July 1925 advertisement - which included a listing of domestic corporate, foreign, and tax-exempt bonds - mention is made in a side note: “Our July circular describing briefly a number of the foregoing securities will be sent on request.” In later ads, there is the simple message “Descriptive circulars sent on request” or “Full details will be sent upon request.” It thus appears that what we might today call “investment research” was being conducted by Becker as early as 1925. However, such reports may generally have covered companies underwritten by Becker, and may have been more “informative” - a regular updating of developments within the issuer - more than “critically analytic” of the company’s affairs especially as related to other companies in the same industry. The organizational unit of Becker that was handling this work was still referred to as the “statistical” or “analytic” department which also suggests more of an accounting than evaluative/interpretive approach. It does appear, however, that in connection with the firm's purchase and sale of blocks of certain high-grade common stocks (as earlier mentioned), circulars of an investment research character were developed and provided to prospective investors to aid them in understanding the security, issuer, and Becker's opinion of the longer-term value of the available securities. As noted earlier, David Friday, a nationally known economist, joined the firm and apparently had an involvement in the development of Becker’s “statistical” or “analytic” department, from about 1925 well into the 1930s. The actual head of this department appears to have been Jay Dunne. It is unclear how this department carried on into the 1930s or whether, in fact, it was left to "wither on the vine" in light of the firm’s expense reduction efforts. Notwithstanding the adverse stock market and expense considerations, the firm was intent on a quality expansion of its marketing capability. In early 1930, the press noted the death of William L. Jacoby. Jacoby was the youngest person ever to be admitted to and then to graduate (at age 18) from Lehigh University as a mechanical engineer. Formerly in the steel business, having founded the Interocean Steel Co. in Chicago at age 34, Jacoby joined Becker in 1918 and became a Vice President in January 1925. He was apparently one of the first, if not the first, younger, highly trained, all-around investment banker(s) hired into the firm to develop new investment banking assignments. He left Becker in March 1927 to become the President of Kellogg Switchboard and Supply and died a few years later at age 56. Key Becker personnel were beginning in the early 1930s to become directly involved in securities industry matters. In May 1930, Francis Patton was elected President of the Bond Men’s Club of Chicago and in 1932, became Chairman of the regional committee overseeing the newly adopted investment bankers code. In 1934, Patton was elected Chairman of the central states group of the Investment Bankers Association and became increasingly involved in discussions relating to the newly enacted Securities and Exchange Acts. Patton began to lead the local code committee in reviewing complaints of fraud against investment dealers doing business in the central states. Later in the decade, Patton became a key officer in the central governance of the IBA, and somewhat later, he was elected to the Board of the National Association of Securities Dealers. In 1931, Joe Levin was recognized for his leadership of the Becker advertising programs and became an officer in the Chicago Financial Advertisers Association. 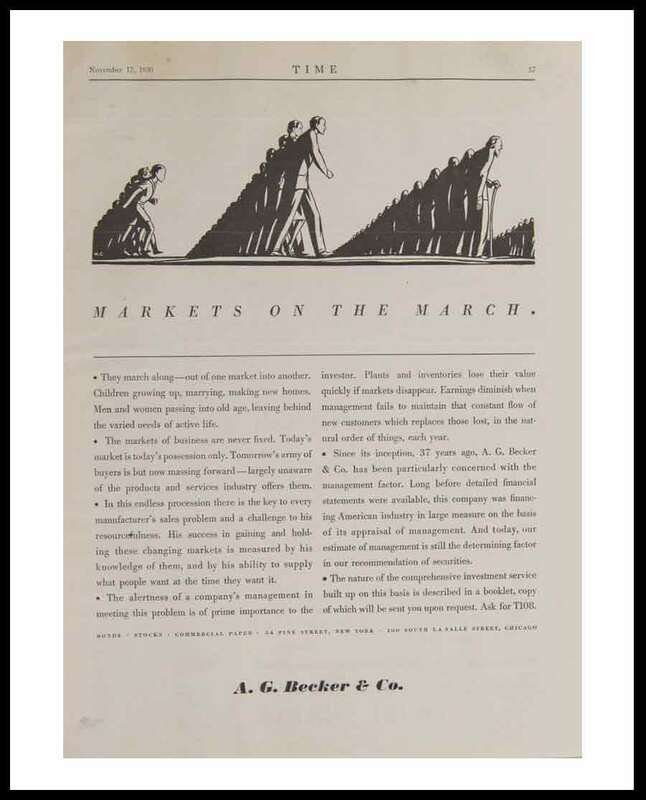 Joe represented the firm in receiving not only a local award from the CFA, but as noted in Appendix-5, from the Harvard Business School, for Becker's advertisement series and in particular, the “Markets On The March” ad published in the Chicago Tribune on February 6, 1931. In September 1936, Joe Levin was elected Vice President, having joined the firm in 1922. He had this impressive role in the firm’s advertising program and later served as an investment banker. 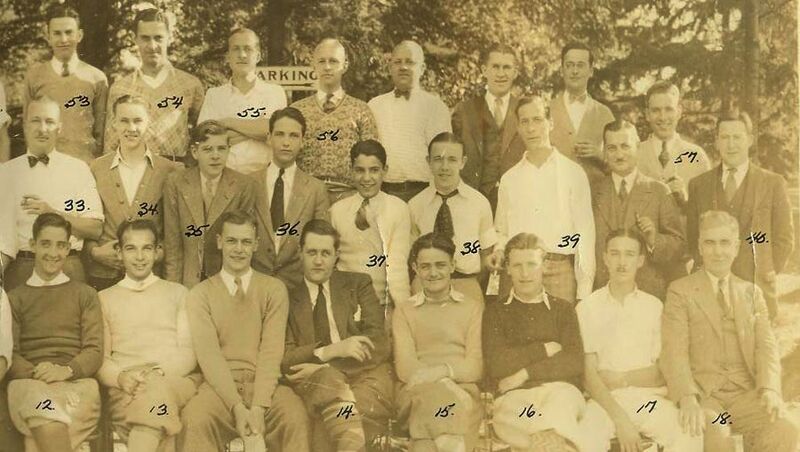 In February 1935, Howell Murray was elected President of the Bond Men’s Club of Chicago. Later, in the 1950s, Howie became Chairman of the Ravinia Association and, as a leading volunteer and donor, was celebrated by the naming of Ravinia’s recital hall in his honor. In 1937, in the New York office, Foy W. Porter, a bond salesman and two handicap golfer, was elected President of the Bond Club of New Jersey. In December 1935, Irving Sherman and Lester Roth were elected Vice Presidents, Irving by this time having organized and managed the Berlin office for some seven years. Art Curtis joined the Chicago office in 1927 right out of Northwestern. He became an assistant in the sales management and syndicate functions in the Chicago office and in the mid-1930s was transferred to the New York office apparently to assist in handling the German dollar bond underwriting and trading. In early 1939, he was sent to the Berlin office to assist Irv Sherman, but soon was on his way back to the U.S. He then enlisted in the U.S. Army and served for some four years, mustering out as a Colonel. As described earlier, and as summarized in Wikipedia, by early 1929, it was evident that the German people and government would not willingly make the reparation payments as provided in the Dawes Plan. Owen Young, a leading U.S. businessman and member of the Reparations Commission, was asked to head a new committee to review the situation. By mid-1929, the Young Committee made its recommendation to reduce the reparation payments by 20%. In the meantime, the U.S. stock market had crashed and the Great Depression was under way, with significant disarray in the U.S. banking system. World trade collapsed, unemployment in Germany mounted to over 30%, and the German banking system went into crisis. President Hoover arranged a one-year moratorium on reparations as a temporary remedy. At the Lausanne Conference in 1932, the Allied Power states and Germany agreed to reduce the aggregate reparations from some $32 billion to just over $700 million, subject to the U.S. agreeing to cancel the debts owed to it by its former Allies. Congress rejected this plan and technically the situation reverted to the Young Plan proposal. All reparations were soon repudiated by the National Socialist party which came into power in 1932, with Hitler being elected Chancellor in 1933. As was carried out in late 1925, a component of the Young Plan was a multi-currency loan to Germany offered by banks in nine countries totaling some $300 million, of which the U.S. portion was $98 million. The U.S. “Young Loan” was marketed on June 12, 1930. The U.S. underwriting syndicate was headed by J. P. Morgan & Co. managing 44 other underwriters and involving upwards of 1,000 banks/dealers in a selling group. The trustee for this loan was the newly formed Bank of International Settlements in Basel. The loan was for 35 years and it was offered at 90 with a coupon of 5 ½% and a yield of 6.2%. The underwriting discount was 4.75% and thus the net proceeds were 85.25, or some $92.8 million. The offering was oversubscribed in all countries and currencies in which it was offered. Interestingly, the New York Times digital archive does not include a tombstone for this financing (that the author could find), whereas the Chicago Tribune archive did have one. As in the case of the Dawes Loan, the Tribune's tombstone does not - very mysteriously - include A. G. Becker Co. as an underwriter. In March 1930, the New York Times reported that A. G. Becker & Co. calculated that, since April 1, 1929, some $100 million of German dollar bonds were retired or targeted for retirement, as compared with $25 million retired in the prior year via sinking fund repurchases. In light of the illegal and horrific holocaust developments in Germany and in German-controlled areas of Europe from the mid-1930s until the end of WWII, one wonders what readers of the New York Times made of this story?? Didn’t this and other similar reports provide an authentic and clear advance warning as to intentions of the Nazi party? Notwithstanding the optimism in mid-1930 about Germany’s economy and its ability to repay its obligations, clouds began to appear in 1931 and the price of German dollar bonds dropped significantly in July 1931. There was talk of the need for another moratorium on reparations payments. Advertisements by A. G. Becker right up through 1931 were promoting German dollar bonds with their lower prices and attractive yields. In early 1932, it was noted that the dollar obligations of a number of German municipalities in the U.S. market were now selling at 50% of the value of the same or comparable securities in dollar-equivalent reichsmarks in the German market. German dollar bonds owned by German citizens and trading in Germany were selling at twice the price of the same bond in the U.S. market. The problem was becoming clear. Germany was realizing totally inadequate foreign exchange in its balance of trade with the U.S. and was very short of the level needed to meet the interest on its reparations and private debts in dollars, never mind any principal repayments. Mid-1932 marked the first default of a German dollar bond issuer - Saxon Public Works - neither the issuer’s application for dollars or for reichsmarks with which to pay interest was approved. By September 1933, there were seven other German dollar bond issuers defaulting on their obligations by reason of central control on currency transfers. This group included the $2.5 million Unterelbe Power & Light mortgage bonds due 1941, which issue A. G. Becker & Co. underwrote and distributed in 1926. In a November 1932 issue of the New York Times it was reported that German bonds in the U.S. were being bought up for German account. “Even if German securities from the holdings of defunct Middle West banks are being offered at bargain prices - as the rumor goes - there are not enough German funds in the U.S. or elsewhere to absorb great quantities of them. The bonds which were first available at 26% of par, are now selling at 50%.” A reasonable guess is that A. G. Becker was in the midst of assisting a wide range of bank managements and receivers to liquidate their German dollar bond holdings by delivery to the Becker Berlin office for redemption by the issuer. In mid 1933, Hjalmar Schacht, President of the Reichsbank, announced a moratorium on all external debt service payments followed in due course by a plan to permit the payment of defaulted interest on private debts of German entities using 50% cash and 50% in reichsmark scrip. This offer was later reduced to 30% cash and 70% scrip. The scrip was a claim on a German bank set up for this purpose to issue marks when and if available at some future time. In due course, these scrip claims, being offered to U.S. citizens (holders of German dollar debt of private issuers) and the bank issuing them needed to meet the newly established disclosure requirements under the Securities Act of 1933. The filing for the scrip was finally approved and the offer was made to the holders of defaulted bonds in 1935. At about this time, the German Government decided - apparently as a substitute for the scrip plan - to issue and offer 10-year 3% notes in payment of deferred and defaulted interest on its outstanding dollar bonds. From 1932 through 1935, the Reichsbank (on behalf of the German government) and various private entities which had issued dollar bonds which were in default, were busy repurchasing these obligations at deep discounts from par. From various reports, estimates of the amount of dollar bonds privately issued and outstanding in the U.S. by 1930 (and thus excluding Dawes and Young Loans) centered on some $1.25 billion. It was also estimated that some 200,000 U.S. citizens owned over 100 issues of German dollar bonds in 1931. By 1935 the par amount of German dollar bonds outstanding had been reduced to some 50-60% of the 1930 level. Thus, some $500 million in bonds had been repurchased for perhaps $200-300 million and involved commissions or principal gross profits of 4-5% being realized by the intermediary banks handling these repurchases. The author estimates that some $10-15,000,000 in gross income was earned by these banks in the 1932-35 period, and this group included A. G. Becker & Co., possibly with a prominent position. It appears that the German government was in fact not paying or authorizing the payment of interest on its dollar bonds even as late as 1938. The New York Times of November 27, 1938, reported that, in an admonishment of the German Government, the U.S. State Department had “knowledge that various German dollar bonds selling in the American market at extremely low prices, because of lack of payment, continue to be repatriated by Germany, exchange being made available for that purpose.” And “the German Government must recognize that a continuation of this situation is certain to intensify a feeling of injustice and discrimination.” There is no evidence that this message had any effect on the German authorities. The rise and the philosophy of the National Socialist (Nazi) party was clearly evident in 1930, as noted earlier, leading to Hitler’s accession to the Chancellorship on January 30, 1933. Hitler quickly solidified his central position and became Fuhrer in 1934. From 1933 through 1939, Germany experienced a rapid economic recovery. Under Hitler’s leadership, Austria was unified with Germany in March 1938; later in the year, the Munich Agreement provided for the Sudetanland district of Czechoslovakia to be absorbed by Germany. Then, in September 1939, Germany invaded Poland, and World War II was underway. The “chief financial officer” of Germany during most of the period between 1925 and 1939 was Hjalmar Schacht. Schacht was born in 1877 and after a college education joined the Dresdner Bank. He was in the military service during WWI, afterwards rejoining the Dresdner and other banks in the early 1920s. In the mid-20s he was appointed President of the Reichsbank and served until his resignation in 1930. After a period in politics, during which he became a supporter of Hitler and the Nazi party, he was once again appointed President of the Reichsbank in March 1933. As has been described earlier, there was steady resistance by Germany (under Schacht, carried out by the Reichsbank) to making reparations payments from the time of Versailles on, and especially in the 1930s. By 1938, Schacht had become disillusioned with the antisemitic policies and actions of the Hitler government. Finally, in 1939, Schacht could not support these and other policies of Hitler and he was summarily dismissed as the Reichsbank President. Schacht more or less faded into the background and later participated in an unsuccessful plot to assassinate Hitler. After the war, Schacht was tried and acquitted in the Nuremberg Trials. Although there is no evidence in the Becker archives, but based on stories, it is believed that Irving Sherman, after taking up residency in Berlin in 1928, became a trusted business connection of Schacht and his staff. These contacts were believed to be central to Becker’s apparently substantial role in brokering and otherwise facilitating the German dollar bond repatriation program from about 1932 to 1939. It is likely that A. G. Becker was involved in many millions of dollars of bonds being purchased in the U.S. and delivered to Berlin and that the gross income from these purchase and sale activities was a major factor in keeping the firm alive and the organization together during the 1930s. Coming back to the two issues of the Stinnes enterprises underwritten and sold by Becker in the U.S. in 1926, the bonds outstanding in the U.S. by 1936 had been reduced from the original $25 million to some $8.3 million, at which point the parent and subsidiary company underwent a reorganization. These bonds were finally retired with accumulated interest (at 4% from 1936) in 1954. In 1957, the Deutschebank, through A. G. Becker and Irv Sherman’s assistance, acquired the common stock of the Hugo Stinnes Corporation owned by U.S. shareholders for $37/share. The stock had sold at one time for as little as 52 cents/share. After the war and his Nuremberg acquittal, Schacht, in 1953, started a private bank and economic consulting business which he led until 1963. He died in 1970. It is not known whether Robert Schaffner had any contact with Schacht in the 1930s, on visits to Germany or elsewhere, or whether Irving Sherman before his death had any post-War contact with Schacht. As noted earlier, the stock market continued its decline into mid-1932 and then began a gradual rise which, with some zigging and zagging, continued over a five-year span to 1937, to a level up four times the low of 1932. After 1937, the market was generally down until 1942 and then up some 50% to 1949. During the thirties, the domestic securities business clearly became less active as investors licked their wounds and the economy tanked. Investment trusts, like the stocks they owned, were down in value with the crash. However, in an April 1930 advertisement, Becker said: “It is becoming increasingly apparent that well-managed (investment) companies did substantially better than was at first thought and substantially better than most individual investors were able to do for themselves.” The ad went on specifically to promote the Allotment Certificates of the Becker-sponsored National Securities Investment Company. At about the same time, a Becker ad suggested that it might be a good time to buy some selected real estate securities at very depressed prices. In June 1930, it was announced that Manhattan-Dearborn Corporation would acquire the Lawbeck Corporation. It will be remembered that these corporations were formed and publicly financed by Becker in 1928-29. It will be remembered, too, that Lawbeck was organized to finance the construction of properties that, when completed, would be eligible for permanent long-term mortgage financing. Manhattan-Dearborn was in the business of making equity investments in real estate. Both corporations were to continue their respective lines of business. After the consolidation, Manhattan Dearborn’s assets mounted to $25 million. Also in 1930, Auto Strop Razor, a long-time Becker client, was merged into the Gillette Razor Company. David Stern, an Auto Strop Director for many years, assisted in the negotiations of this merger. Promptly after the merger, a Becker advertisement highly recommended Gillette as a sound, long-term common stock investment - which of course it turned out to be. Later in the year Atlas Utilities acquired the Becker-sponsored National Securities Investment Corp. with net assets of about $11 million, bringing Atlas’s assets up to some $85 million. Led by Floyd Odlum, Atlas had made a number of holding company and trust acquisitions adding some $60 million in assets since the beginning of the 1930s. Hardly any Becker ads in the 1930s recommended the purchase of common stocks, and as noted earlier, the advertising program was substantially reduced starting about 1932. The common stocks of a few companies were promoted in ads, and research reports were available on request, including AT&T and Gillette. During the decade there were a number of initial public offerings where Becker had a managing or special role, including Hall Printing, Gardner-Denver, Compressed Industrial Gas, Diamond T Motor Car, Otis Steel, National Supply, Loew’s, Inland Steel, Universal-Cyclops Steel, Western Auto, Burlington Mills, Basic Dolomite, and Nunn Bush. There were repeat managed offerings for Abbott, National Bond & Investment, Construction Materials, and Wieboldt's. There were some equipment trust deals, and some municipal bond underwritings, and of course, a modest flow of participations in underwritings managed by other firms. And there was probably a reasonable amount of salesman-generated and otherwise unsolicited stock and bond transactions where Becker had an inventory position or where the orders were executed as agent. One way or another, however, even with reduced overhead, transactional activity - except for German dollar bonds - was apparently pretty skimpy for many years. In January 1931, David Friday, continuing as Becker’s economics advisor, had become President of the Becker-sponsored Domestic and Foreign Investors Corporation. At a convention of soft goods merchandising executives, Friday was cautiously optimistic about the year ahead, predicting a gradual revival leading to a 25% increase in industrial production. Ten months later, in November, with a continuing decline in the economy, Friday joined other economists in strongly castigating the Federal Reserve for its contractionist policies, urging the Fed to change its policy and use its powers to buy government bonds, expand credit, and break “the vicious cycle” the economy was experiencing. David Dattelbaum, a Cornellian like Jim Becker and Irv Sherman (who probably recruited Dave), joined Becker in 1927, and after a few years as a successful salesman, was appointed Sales Manager for the New York office. The sales force was initiated with June Johnston’s arrival and the 54 Pine Street building was purchased in 1926. 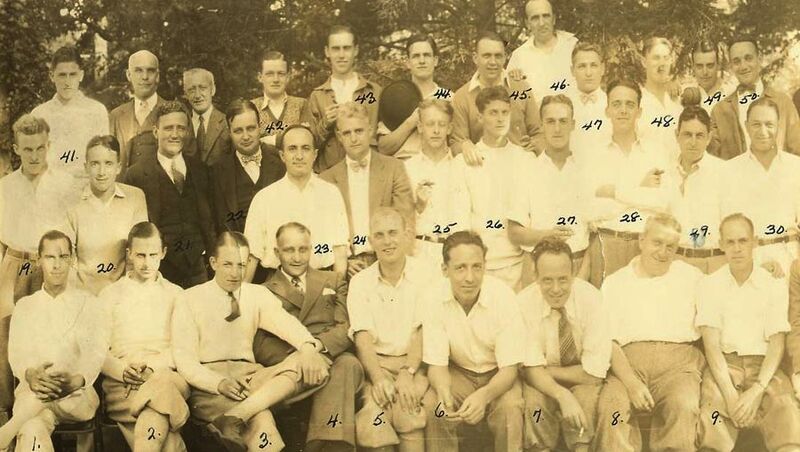 By 1928, the group had grown to some 40 salesmen. Some salesmen were on the main floor and overseen by Cyril Haws and Don Smith, who Dattelbaum said “was a terrific sales leader.” The group on the upstairs floor was under a Dave Buno. 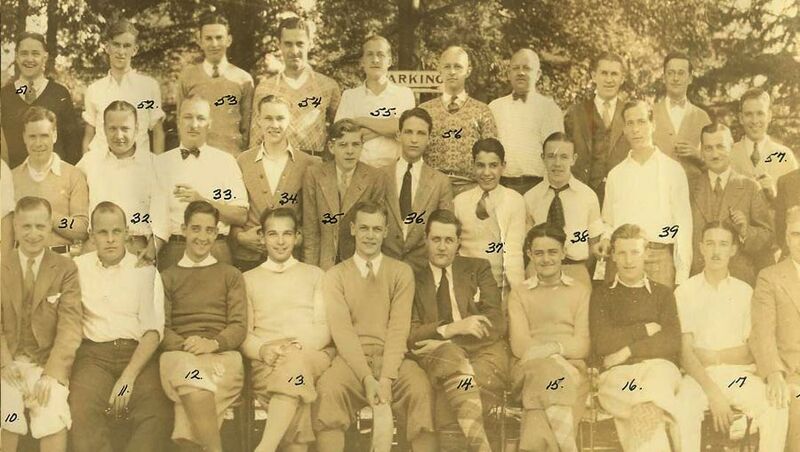 As noted earlier, the New York office sales force apparently had a golf outing in the fall of 1930 including the photo which is shown (three sections: left, center, and right). (It is too bad the archives do not contain the key to this photo.) Within a few years, the New York sales force was cut by 50%. The traditional business of A. G. Becker & Co. - commercial paper - almost “disappeared” in the early 1930s. National commercial paper outstandings dropped from some $400 million, at the end of 1929, to only $84 million in 1933. Outstandings were up by 1938, to just short of $300 million, but rates had declined from their peak in 1929 of 6 1/2% to as low as 1% in 1933, and then leveled off at ¾ to 1% between 1934 and 1938. Not much room for a dealer discount. In August 1936, the Tribune reported that the Continental Illinois National Bank & Trust, owner of 14.3% of the Middle West Corporation, was in negotiations to sell this interest to the Chicago Corporation, an investment company, for $5.7 million, acting for itself and A. G. Becker & Co. These shares were obtained in an earlier reorganization of that company. It was reported that Becker would take 40% of the block. Middle West Corporation was the successor to the Middle West Utilities Company, considered the “keystone” company in the now defunct “Insull Empire,” in receivership since 1932. Dave Stern, Vice President of Becker, reportedly worked with Charles Glore on this purchase; Glore was President of the investment banking firm Field, Glore & Co. and also President of the Chicago Corporation. Within a few months, Field, Glore & Co. purchased an additional 85,000 shares from another shareholder. Stern is reported as saying that Becker would likely offer its shares publicly at some future point. It is not known whether this 1936 Chicago Corporation was a predecessor to The Chicago Corporation which was an investment dealer in the 1950s and forward, and which will be mentioned later. In 1933 and 1934, along with almost every other investment dealer with business activities in the State of Illinois, A. G. Becker participated in the underwriting and distribution of two issues of “Relief Bonds” of the State of Illinois totaling $50 million. At the time, Illinois’s bonded debt was $228 million and the state’s population was 7.6 million. Much has happened since then. On the personal front, A. G. Becker’s widow, Kate, died in Highland Park on February 8, 1938, leaving an estate of $776,000 to her beneficiaries. Mrs. Becker had earlier sold the Abraham Becker mansion in January 1935 to M. L. Rothschild. As has been a pattern all through the years, jubilation, unbridled optimism, greed, and get-rich-quick emotions were expressed in the stock market of the late 1920s. This was followed by the very sobering crash in values and dreams, and even in lives. After this there was a period of national self-examination and critique leading to government regulation with the view to avoiding such behavior in the future. Legislation and regulation took two different but related avenues. First, the Glass Steagall Act of 1932 required the separation of commercial and investment banking. A number of commercial banks spun out their securities business, or the employees in those departments amicably departed and formed a securities firm. As an outcome of this act, among other examples, Morgan, Stanley & Co. emerged from J. P. Morgan & Co., and Harris, Hall & Co. emerged from the Harris Bank & Trust Co. Concentrating more on the way established securities and investment banking firms operated, the Securities Act of 1933 was legislated to regulate a major portion of the offerings and sales of securities in the U.S. The main intent of this act was to require issuers of securities to register their offerings with the Securities and Exchange Commission and to provide “full disclosure” of all material facts and aspects of their business and the security in a prospectus. The information to be provided would be that which a reasonable shareholder would require to make a thoughtful decision. Under the new law, all those parties connected to an offering - the issuer, auditors, counsel, underwriters, and distributors - would assume certain liabilities when choosing to be part of the process of offering and selling securities to the public. A sister law - the Securities Act of 1934 - was adopted in June 1934 and set up a range of regulations relating to the trading of securities, whether “over the counter” or on an exchange. A. G. Becker & Co. presumably had to “adapt” to the new world of securities regulation, as did all other investment dealers and commercial banks who had been in the securities business. As noted earlier, Fran Patton and subsequently Andy Baird were deeply involved in IBA affairs. Patton was apparently an industry leader in promoting stiffer ethical standards, and training in and adapting to the new laws throughout the country. From various hints in the archives, it appears that Joe Levin became the firm’s first “compliance officer,” especially as to the adequacy of the information in registration statements and prospectuses for which Becker was responsible as a managing underwriter. Sometime in the late 1930s or 1940s, Kent Sykes, backed up by Harold Wood, took over this responsibility. It was fortunate, in a way, that commercial paper was exempt from registration, although the “anti-fraud” provisions of the 1933 act prevailed as to sale of all securities, including open market notes. In 1933, perhaps encouraged by the discussion then underway about investor disclosure and protection, the Foreman Bank & Trust Co. and A. G. Becker were sued by investors in the mortgage portfolio certificates underwritten in 1927 by Becker. The contention was that the Foreman Bank sold to the mortgage trust of which the Foreman Trust Department was trustee, mortgages that turned out in 1933 to be substantially less valuable than the Trust’s purchase price. In due course, the Trust was put into receivership and liquidated with investors realizing 33-50 cents on the dollar. It is not clear when and how Becker may have contributed to the final settlement and how much it may have cost, but it was a good introduction to the legal exposures of selling securities to the public, which now would be more highly regulated.